New beginnings. 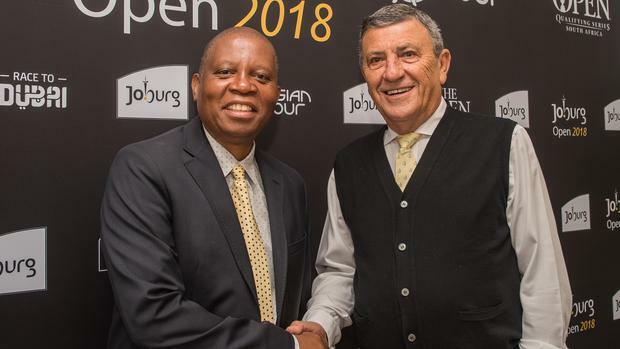 The City of Johannesburg looks forward being the proud new host of the South African Open that tees off from Dec 6 to 9 at RandPark Ridge Golf Course. Mayor of JHB Herman Mashaba and Selwyn Nathan, Commissioner of the Sunshine Tour- spearheaded the merger. THE CITY of Johannesburg looks forward being the proud new host of the South African Open. One of the most historic national Opens in golf will now be played at Randpark Golf Club from December 6-9, 2018. The Sunshine Tour decision was taken in partnership with GolfRSA, the City of Johannesburg, the European Tour and Asian Tour to create an even greater stage for the South African Open by merging it with the Joburg Open. The South African Open will be played on Randpark’s two championship golf courses, Firethorn and Bushwillow, and will feature a field of 240 professionals – including Louis Oosthuizen, Branden Grace, Charl Schwartzel and former champion Brandon Stone – competing for a minimum of R17.5 million in prize money. “The new South African Open brings together the invaluable passion and support of the City of Johannesburg for professional golf with the second oldest national Open in the game, and the result is now one truly world-class golf tournament,” said Selwyn Nathan, Commissioner of the Sunshine Tour. This will mark the third time in its history that the South African Open will be played at Randpark. It was played here in 1995 when Retief Goosen beat Ernie Els by five strokes, and then again in 2000 when Swede Mathias Grönberg took the title. As the official player-host of the South African Open, Ernie Els said he is looking forward to this next step in the continued growth of the championship. “It’s been an exciting last few years for the South African Open in which we’ve made this tournament one of the great championships of world golf again. This is another important step in this process, with a major internationally-recognised city such as Johannesburg aligning itself so strongly with our national Open,” said Els. Els is also an International Ambassador of the Asian Tour, and Asian Tour Chief Operating Officer Cho Minn Thant said they are delighted to add the South African Open hosted by the City of Johannesburg to their schedule. The South African Open will occupy a premier place as one of the first tournaments on the European Tour’s new season. “It has been our privilege to play a role in the growth of the South African Open and we look forward to taking this even further in its new role with the City of Johannesburg as a partner,” said European Tour Chief Executive Officer Keith Pelley. In addition to this exciting new announcement, the Soweto Country Club will also become the official legacy project to the South African Open. Working with the City and corporate South Africa, efforts are underway to ensure that the Soweto Country becomes a top golfing destination. For the City of Johannesburg, this represents an opportunity to not only create potential new jobs with the community but also presents an opportunity to grow the sport of golf in our previously disadvantaged communities. The SA Open, dating back to 1903, is the second oldest national Open in the world, behind the British Open. Meanwhile, Golf clinics will be held at the Randpark Golf Club. They will be held on Wednesday from 9:30am until 10am. It is an annual event hosted by the City of Johannesburg that sees more than 120 youth’s from Soweto, Alexandra and Eldorado Park, being mentored by 10 professional Golfers.